4k x 2k HDMI Switch 3 Way with Remote Control. Manual, remote and intelligent switching. HDMI to VGA Cable 1m Connects HDMI to a VGA monitor or TV Length 1 meter Built in electronic converter Supports up to 1920 x 1080 @ 60Hz Gold plated connectors Input HDMI. Output VGA. No external power required. Please note this is a direction cable, it only converts HDMI to VGA and not the other way around. 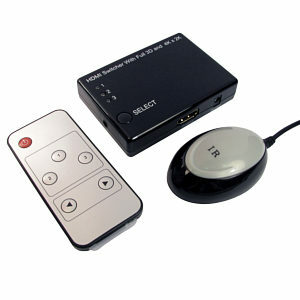 Infra red remote control over HDMI kit. Allows IR remote control signals to be sent via an HDMI cable. 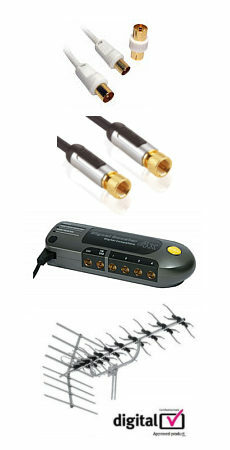 Kit included 2x HDMI IR adapters, 1 IR transmitter and 1 IR receiver. Powered via HDMI cable. Easy to install. Gold plated HDMI connectors. Simply plug an adapter onto each end of your HDMI cable, plug the receiver unit into the adapter where you will be using the remote control, plug the transmitter unit into the adapter near the equipment you want to control.